Reports have upped the number of LGBT protesters arrested in Russia yesterday at well past 60 with many reporting being harassed and beaten by Police. And guess what? The International Committee appears to be just fine and dandy it. 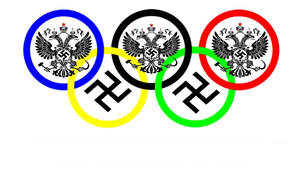 “We understand that the protesters were quickly released,” Emmanuelle Moreau, the IOC’s head of media relations, said in an email to BuzzFeed. “As in many countries in the world, in Russia, you need permission before staging a protest. We understand this was the reason that they were temporarily detained. Unfortunately in Russia you can’t get permission to stage an LGBT protest because LGBT protests are outlawed. Raise your hand if you are really surprised. Watch Rachel Maddow’s report on the arrests here.